and costs typical for an aircraft family build 700/ year. 797 production rate per equals the production rate of 737+777+787 per year. Boeing might as well try. You lose weight due to optimisation. You must not understand the theory so I will stick to real life examples. The A330-200 is a 7000nm frame the A300 is a 4000nm frame. The cabin areas are only 10% apart but they have a massive OEW 35% difference. We can scale weight A300 up to the same cabin area the weight only becomes 96T. This is still 24T lighter than the A330-200. Now the A300 engines had worse SFC than the A330's. If you put low SFC engines on the A330 the range would drop from 7000nn down to maybe 6000nm. So you've gained 26T of empty weight going from a 4000nm optimised frame to a optimised 6000nm frame. Yet you do not think going from a 4000nm to 8000nm frame would gain 40T. The best eay to determine if a plane is overweight is to look at the empty weight as a percentage of max takeoff. The 767-200 non ER is one of the worst aircraft in this regard. The A350 mtow is more than 100% higher than its empty weight. The 767-200 non ER has one of the lowest percentages. Every part of the 767-200 is overweight. They were heavy on purpose to allow for a MTOW increase and stretch. RJAMZ - I may have been a little hasty saying you can't get 40% lower trip costs in an NMA with more floor Area than an 788. I don't really know. Is it possible? What exactly is included in the definition of trip costs? I was thinking along the lines of what RR did with the Trent 700 to upgrade it to the 7000. From you're saying you don't believe that is possible on the Trent 500. If RR decides to scale down Trent 1000TEN wouldn't there be a possibility that engine would heavier than its competitors? ... Honestly, the only way I see Pratt entering this race is with someone else. I don't think Pratt can handle this by themselves. My best guess is the 270 seatcount puts the 797 close to the 767-300ER since theoretically the 797 is designed to be used mostly on flights that wouldn’t have lay flat seats like a 787, but we don’t know what configuration is being used. I think trip costs cover fuel, crew, maintenance, insurance, airplane ownership, etc per flight regardless of seatcount. When I say trip costs I consider only fuel and airport fees. They are easy to calculate and isolate. The shorter the flight distance the greater the airport fees become percentage wise. On a short 500nm flight between two busy airports the fees can nearly equal the cost of fuel. For an aircraft that will be doing short flights there is then a big incentive for the designer to reduce empty at the expense of fuel burn. The A321LR is a good example of this, it is underwinged which is great to keep empty weight and airport fees down. But the stepped climb significantly increases fuel burn on long 3000+nm flights. People do not realise just how bad a stepped climb is for fuel burn. Lucky for Airbus they have only had to compete with 30 year old 757 and 767 designs. For an aircraft that will be doing long flights there is a big incentive to improve lift to drag ratio with a big wing. Empty weight is not a big issue, you might add 10T to the empty weight with a big wing but reduce trip fuel burn on a long flight by 5T. Total takeoff weight might be heavier with more airport fees but on a long flight the fuel saved exceeds the extra fees. The 787-8 for example is slightly overwinged the 787-10 is slightly underwinged. The 777X is slightly overwinged but the 777-300ER is slightly underwinged. I expect the 797 to be slightly underwinged like the 787-10 but not as underwinged like the A321LR. On a 4000nm flight that would see an A321 start its climb at 29,000ft the 797 at that flight length would go straight to 40,000ft. Only when loaded for a 5000nm flight would the 797 need to step climb. This would give the 797 a big and often understimated advantage on a 4000nm flight. CASM often includes purchase price which requires big assumptions. I personally find it hard to accurately calculate. The Trent 1000TEN is state of the art and has excellent fuel burn and power to weight ratio. An engine perfectly scaled down to 70% of the thrust would be a perfect choice for the 797. It would be a big investment for RR as every part would have to be brand new and scaled down. Any part retained from the larger engine would start to make it overweight and non optimised. Data on how profitable and how desirable cargo is to how many airlines, is crucial information that I'm sure Boeing won't ignore. with a plane that sitting in the middle of successful planes Higher and lower then it's self, I agree with you cargo might be necessary to get the airlines, and numbers needed to launch this project. I am confused about this statement. The Trent 7000 wasn't a direct upgrade from the 700. The Trent 7000 is basically a Trent 1000 TEN with bleed air. They will take the 737 approach, bulk loading cargo. With regards to seating, if the 797 is to have narrowbody economics, the measure would be narrowbody seating. As in what A321LRs have today, around 200 seats. Not an AA 321T with lie flat seats, but only 102 seats total in the same floor area. Looking at 763 seating, the DL domestic configuration and the HA configuration were both at about 260 seats with domestic recliners up front. Whereas a DL 763 with lie flat (and not even direct aisle access for the window seats) is between 210 and 220 seats. So the larger 797 would be 270 seats with recliners, and about 230 seats with 767 style lie flat seats. Different strokes for different folks. Add room (weight) for cargo, lose customers to an upgraded A321. Reduce room (weight) for cargo, lose customers to the 787 and perhaps the A330neo if it lingers on. Boeing has announced that with the exception of a few Asian carriers, that the majority of the airlines have made it clear that lower aircraft purchase price and operation cost outweighs added cargo volume; thus Boeing is not designing the NMA to hold much cargo at all above normal baggage+ a little extra (and no extra structure and cargo hold size for cargo concerns). While some people here on A-net may feel this is a bad choice. Boeing talked to a lot of airlines over considerable time on the issue of cargo capacity. It appears that the airlines have broadly spoken on the issue to Boeing, and the ones left out are mainly the Asian carriers who handle more cargo than American and European passenger airlines. Boeing has the Data and the numbers, I can't wait to find out what this plane will look like. I love the look of the 757's. I'm more excited about NMA then NNB plane. Not offering global AKH, PKC compatibility on the Boeing 797 would sound like seriously bad idea. Downplaying the capability over the last 20 years, because they simply could not offer it, seems understandable. Denying it for the next 40 years would seem highly irresponsible towards many of their bigger customers. Who have, btw, already voiced their concerns specifically on the Boeing 797's cargo capability: https://www.businesstraveller.com/business-travel/2018/03/12/boeings-cargo-conundrum-build-b797-please-asian-us-airlines/. The question regarding specifying 797 cargo capability seems: Does Boeing take serious it's own Market Outlook? Or do they isolate airline comments that confirm what they want to hear? 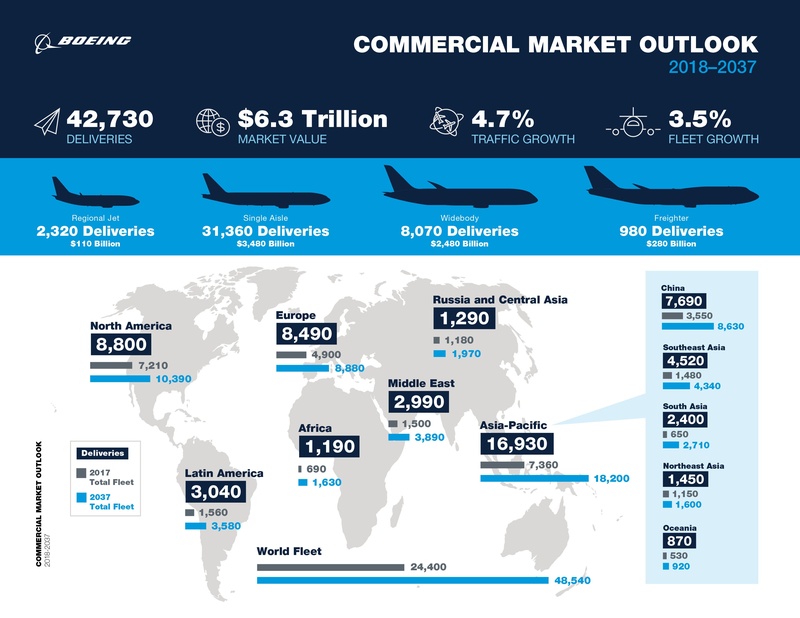 I'm sure Boeing will listen to the airlines, most of who are in Europe and Asia and increasingly prefer the faster, higher capability containers & pallet system. I don't think Boeing will dissapoint customers that want to have the option to use containers or containers + bulk. Last edited by keesje on Mon Feb 11, 2019 9:22 am, edited 5 times in total. 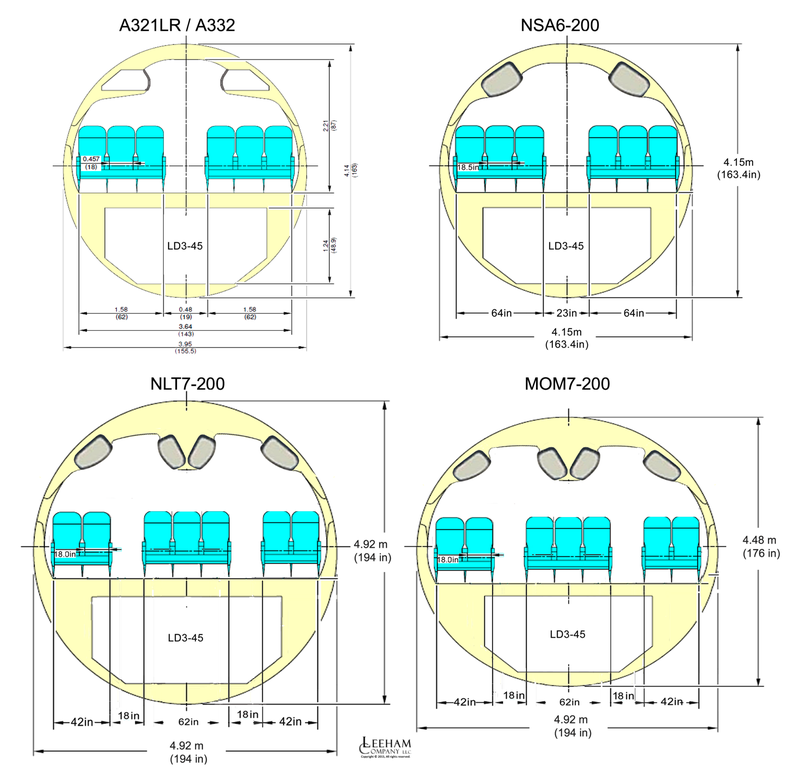 Bulk loading is efficient when it comes to the design of the aircraft but takes a bit longer or Boeing uses custom made containers for the 797. Well speaking of B767, it uses LD2 most of the time because of the size. And now with the speculation of the design that goes around regarding the 7-abreast variant of B797, it would be elliptical in shape. Which mean that instead of LD2 or LD3, it would use the standard LD3-45 that they use on A32X. Although it's kind of weird though for them to use LD3-45 knowing that it's not compatible with B737 at all. Yes, Boeing will try to fight it's way back into the NMA segment with a new aircraft. Ignoring the existing standard, or inventing a brand new container standard would in my opinion not be a smart approach. If you can't beat them, join them. Yeah, their only problem now gonna be the Chinese and the Asian market. They actually wanted the LD3 side by side or at least the minimum of LD2 side by side. Hence the elliptical shape might not work and they have to go with the standard round shape to get the LD2/LD3. Might as well copy B767 basic plan and replaced the fuselage with composite materials, new wings and new engines to make it cheaper to developed. If we calculate with 35 bags per LD3-45 it would not leave much room for cargo in a high density configuration. Conventional wisdom would indicate a ~circular fuselage would be lighter, cheaper and carry more cargo. But that's from before the MoM oval newspeak. A flat double bubble could be used to reduce the lower body. That only seems useful if Boeing decides to go for a high wing, which seems unlikely for a 250+ seat NMA. With a conventional lower wing and high BPR engines you need groundclearance anyway, so going flat adds weight, reduces cargo space & doesn't have much advantages. This proposal is 787-3 all over again. 787-3 was launched with a MTOW of 163T, wingspan of 51m, OEW of 101T, engine thrust at 52,000 Ibf, and cabin size that matched 788. The result was only 43 orders. Then all of those orders were converted to 788, as it didn't deliver much better economics than 788 while being really limited in range. Boeing then decided to cancel the variant in 2010. Another short-ranged widebody that couldn't attract many airlines. Your numbers looked pretty good in terms of weight but the thrust was a bit off. Need more like 45k to get up. The fuel use for the flight would be about 37t and the MTOW required would be near as dammit 145 to make no difference. 37t is 9.25t/1000nm or 37kg per 1000nm per pax. For an A321NEO at a similar cabin density you'll get 137pax and the fuel use will be 34.5kg per1000nm per pax and taking off at well below MTOW (Max range likely volume limited). If I'm running an airline do I buy one A380797 as proposed or 2 77W A321NEO? The cross section could be as tight as an 163" x 185" Oval - less than a 20% increase in cross section than an A320 with 16.7% more Y seats and up to 50% more premium seats. You can still put an LD3-45 in the bottom if you would like. The extra 35-40" in Fuselage width translates into a lot of extra volume inside an expanded LD3-45. Per Keesje's Extendible LD3-45 concept - the Volume goes from 3.7m^3 to 6.1m^3 in an LD3-45 that is wider in the center to take advantage of the wider fuselage- an increase of 65% for only 1 extra seat in width in baggage space needs. 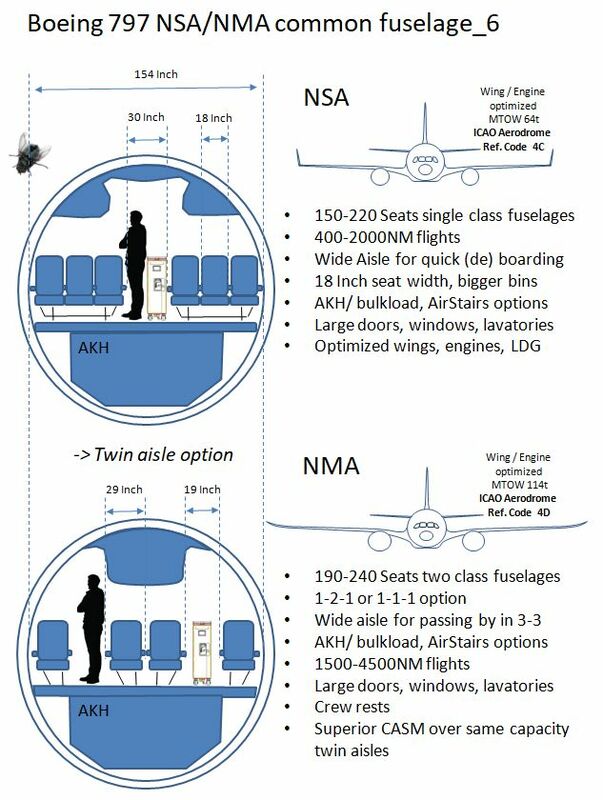 Assuming the NMA fuselage is a little taller than an A320 a bigger container might be another 5-10" higher in height as well getting the increase in Volume up to an increase of 75-85% over an LD3-45. That means a lot less length in the belly taken up by containers for Baggage and a lot more room for pallets. Assuming all the fuel you need is carried in the wing and center tank - that also means no ACT's and a big Cargo Volume advantage over an A321 or any potential variants based on an A320 tube. Makes sense. It should take more cargo than an A321LR with aux tanks. A321LR operators like Air Transat have to bulk load since they can’t fit enough in with containers. With the aux tanks installed airlines can’t afford to lose the volume that containers use up. Similarly I don’t see many airlines wasting space using smaller LD3-45s that are designed for smaller airplanes. A dedicated container for this unique fuselage makes sense. I wonder if bulk loading will be an optional configuration. For airlines wanting to fly lots of cargo, A330s and 787s May be better options. The rise of dedicated freighters in China from SF Airlines, China Postal, etc May factor in the equation. Most operators won't be operating 797's only. More than 10.000 A320 series and x00.000 AKH's will be around. Also with 797 prospects. It just doesn't make sense from a commercial standpoint to ignore / deny your markets. 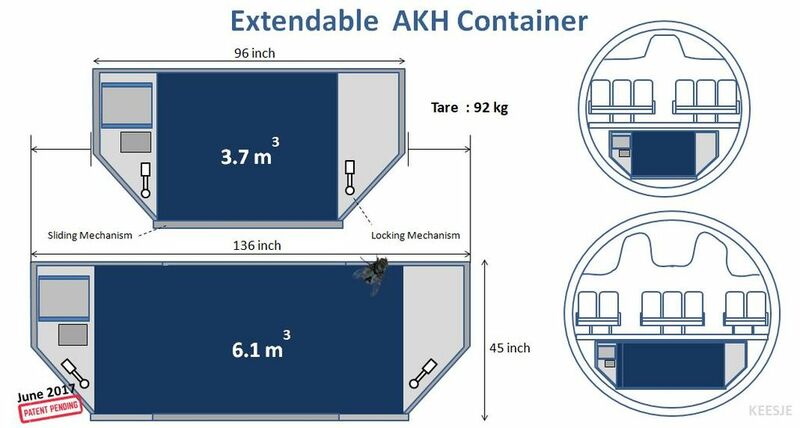 If Boeing would create a cargo option that can handle both AKH/ PKC's, something bigger (e.g. extendable AKH) and bulk load, or combinations, whatever the airline prefers, that would activate some alerts in Toulouse.. Beat them in their own game. Forgive my lack of knowledge of economics but, I feel like Boeing will still be cannibalizing a lot of the 787 market by shooting for 4500nm range (still need a higher fuel fraction and higher AR wing). Also, whatever savings in CASM generated for medium routes (stage length around 2500nm) will deteriorate passed that on lucrative mediumish haul routes where a wider plane like the 787 or 330 can carry more premium seats. What would be so wrong in designing a 7 x abreast plane optimized for 1500-2500nm that is basically a "people mover" for high density routes. Use a much smaller low AR wing because the induced drag savings won't matter as much as well, a strenghtened landing gear for multiple cycles but overall a much lower MGTOW and I guess more efficient. That's my guess on what the NSA based on an 7W NMA will be almost exactly. Same Cross Section/Nose section/Systems - different Wingbox/Gear/Wing/Tail optimized for lower stage length and lower MTOW. Who knows for sure but a 7W NMA should be a lot smaller than 787 - and not haul that much freight so there should not be that much cannibalization of sales. Yes. Boeing will loose the lower end of the 788 market to the 797 (should it be produced). They know that and accept that. The same for the upper end of the current 737 market. Again, known and accepted. This is what has been rumored the NMA/ NSA project is. IMO, this is what has Delta, and the other US majors excited. 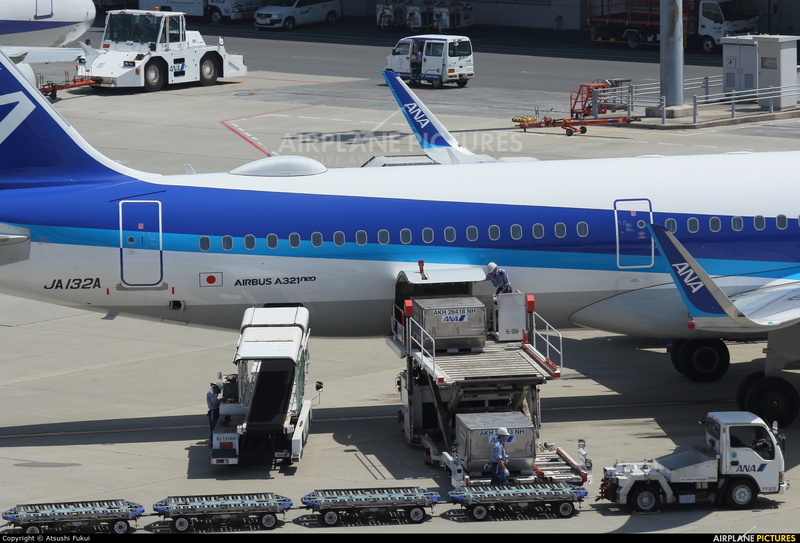 A aircraft designed to carry large number (more than the A321) of pax efficiently. The return of the domestic widebody. If an airline is "really" concerned about cargo, there is the 787/A330NEO. Giving in range and cargo capability to produce razor sharp CASM has been suggested and looked at over the years. However everything that has come out of Boeing so far has pointed towards a 7 abreast WB focusing on a "767 without the cargo but still 5000NM" "sweetspot". So either that or they gave up on fighting the A321s in the smaller segment. Or they've been fighting internally about that, for the last 4 years. Just think about it, Boeing will botch this model even worse than the 783. The A321 will dominate the entire MOM space without any updates, that should be great news. If you have 4000 nm routes with demand for heavy cargo, Boeing's got a plane for that: the 787. There are some routes (think South America-North America during northern winter) where there is ample revenue potential from cargo to justify a heavy widebody. But there are many more routes where the fuel burn advantage of a "light" 797 or even an A321neo would utterly swamp any potential revenue from cargo. I think the light empty weight/less cargo volume route is the right one for this aircraft. 200” cabin width. Allows for 2/3/2 with 18.5” seats, 19” middle seat and two 24” aisles. In cram class you can get 2/4/2 with 17.5” seats and two 20” aisles. Just under a 753 at the low end and just under the 763 at the high end. I think that is the actual plan. The 797 will capture a large portion of the 787-8 market for the airlines that operate them on shorter routes. You might not realise but the 787-8 is built with a much lighter and smaller landing gear which is why the MTOW is lower than the 787-9/10. With these short ranged 787-8 sales gone to the 797 Boeing can then put the heavy/stronger parts onto the 787-8 making what people on here call the 787-8ER. This will simplify 787 production as all aircraft will be very similar with just a fuselage length difference and a slight engine thrust change in software. The 787-8ER would allow many ultra long haul routes to open that can not fill a 777-8. The airline can also substitute one of its 77W's into the frequency, say 1 in 4 flights. Lots of cargo and seats both, already own the plane. Use the 787 on a longer flight where it fits best. What I find interesting is the 797 is three generations later a model designed for the same missions of the A300. A light plane that can fly high cycle routes has interesting economics. [This proposal is 787-3 all over again. 787-3 was launched with a MTOW of 163T, wingspan of 51m, OEW of 101T, engine thrust at 52,000 Ibf, and cabin size that matched 788. No it's not. The 787-3 carried all most of the heavy bits from the 787-8. None of it was optimised for the short range mission. Fully scaled down engines instead of a derate. A smaller tail due to lower engine thrust. Proper scaled down high aspect ratio wing. The optimisation loop could have easily knocked another 10% weight off the design. That would have improved fuel burn per passenger by 10+%. It would have sold hundreds of aircraft, but Boeing did not have the engineering resources to do the proper optimised design of the 787-3. As You can see. The larger variants need to get more range to actually fill the gap. It would kill off B787-8 orders, but the order for this variants has dried up. And it shouldn't hurt the future sales much more. Knowing that many airlines prefer the larger B787-9. And while Boeing said it could carry 270 passengers. It's more likely to hold around 250 pax with the standard all aisle access business class many airlines used these days. Also, premium economy or economy plus. It might get drag down to 220-230 passengers. And both Airbus and Boeing try to ramp up the MAX10 and A321LR capacity in brochure. But give and take, it probably carry 10-20 less passengers than they advertised. So the chart gap differences would be greater between the narrow-body and the widebody. 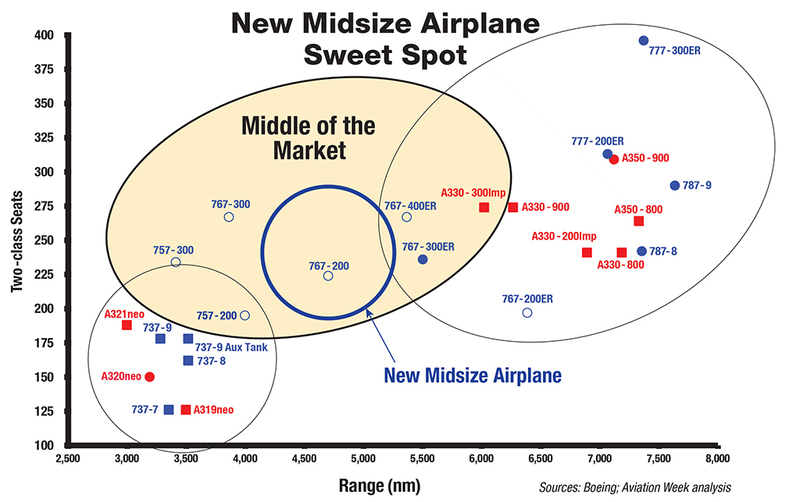 That chart doesn't make sense in terms of Capacity of the NMA - you are basically indicating that the Large NMA (NMA-7) has more floor area than an 788 and almost as much as an 789. At 7W - that would mean the NMA-7 would have to be close to 70M in length. Only 5-6M shorter than an 77W. Lots of interesting speculation on his thread. Speculation seems to never end on the 797'. I do not believe have a 40% cost reduction per seat is possible without new generation engines, and didn't Boeing say awhile ago that they wanted to avoid that? Also, what happened to all the non standard fuselage shapes that the taxpayers constantly fund for NASA research projects? All those billions just p!$$€d away.... But hey, it kept the eggheads busy! Regarding engines, the Trent 1000 TEN / 7000 and GEnx are too heavy. Downsizing them to 50k lbs thrust will be designing a new engine. CFM has already announced that GE and Safran have agreed to let CFM make engines up to 50k lbs for the 797. Pratt has been quiet, but if they find bandwidth they would offer an uprated GTF. Rolls has already said that they have offered the Ultrafan. Upsizing a narrowbody engine gets 5000 lbs to 6000 lbs dry. While starting with a widebody engine won't get much under 10000 lbs. No, no, this number I used came from Boeing's 225 and 275 seats for their B797. B787-8 and B787-9 would obviously be bigger. As I mentioned before on my comment. The more realistic configurations would be around 200 seats and 230 seats instead. And B737MAX10 and A321LR would have less seats for longer flights as well. Understood, it was more of a comparison to RJMAZ post to make sure there was an apples to apples comparison. If these two were to be compared as traveling the same routes then one should expect them to have similar levels of density (read:comfort). I wouldn't disagree on the 200 seats or 230 seats either - I think the plane is a lot smaller than people are thinking. The 50K engine option may be for a future stretch of the NMA, the NMA-8 - which may have a higher Gross weight which would need bigger engines assuming same wing as NMA-6/7 - just like 788 vs 789/10. 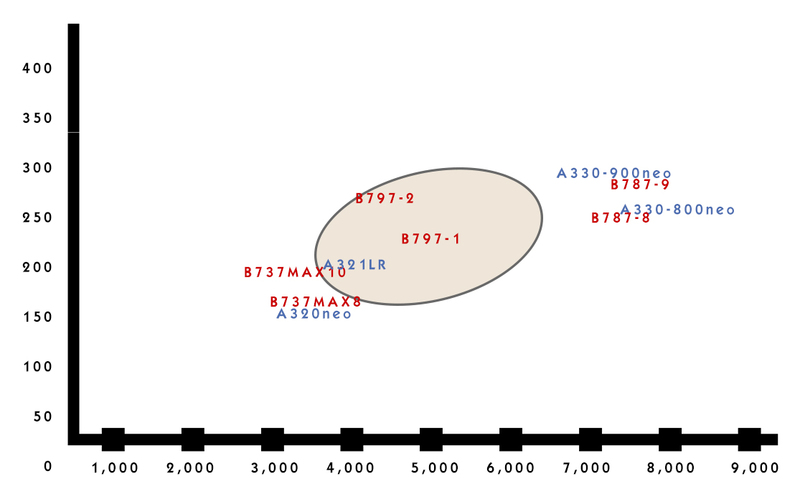 Then in equivalent Densities you have MAX-10 at about 160-170 seats, NMA-6 about 200, NMA-7 about 230-240 and 788 about 288 - putting the NMA right in the middle of the market of Boeing's offerings. Yes, but the main problem as I mentioned before is the lack of range for the larger model. Since B787-8 orders are drying up these days, it's only logical to amp up the range of the larger model to make it close to B767-300ER capability. Otherwise it's not gonna sell as well like B757-300 or B767-400ER. The smaller version capacity and range is great, they just gotta make some modifications for the larger model. From what I keep reading (and quoted earlier in this thread) the larger 797 is optimized for domestic US, domestic China, Domestic India, Middle East to India and other markets under 2500nm. Chinese airports are running out of slots and Us airlines have consolidated to the point of having excessive frequency. This is the premise of widebody with narrowbody economics is that the plane is viable to displace 757s, A321ceos and 737-800s where airlines want to upgauge, but A330s and 787s are too expensive to be worthwhile for shorthaul. The widebodies don’t have particularly great CASM for short missions since they are way overbuilt for those types of routes and they cost too much to purchase. Darren Hulst, a senior managing director of sales at Boeing's commercial aeroplane division, said the NMA was particularly compelling for Australian airlines who are struggling with capacity constraints between Sydney, Melbourne and Brisbane. If it becomes a reality, the new wide-body (twin aisle) plane would fly between 220 to 270 passengers up to 5000 nautical miles, and could enter service as soon as 2025. ... “Whether you’re running out of slots or whether you’re just looking to optimise capacity for the peak levels of demand... an airplane that has the flexibility to carry 20 to 30 per cent more people at the right time is going to be compelling," Mr Hulst said on the sidelines of the International Air Transport Association's AMG in Sydney last week. Boeing is already starting to incorporate some of the 789 parts to streamline production, it is expected as a by-product of this move, some of the improvements done to the 789 will begin to appear on the 788, so we should expect a more efficient 788 coming along progressively.